Crackers are a delicious alternative to chips and can be served with afternoon tea or in a canapé spread. Try serving them a soup or a cuppa. This is an easy recipe. 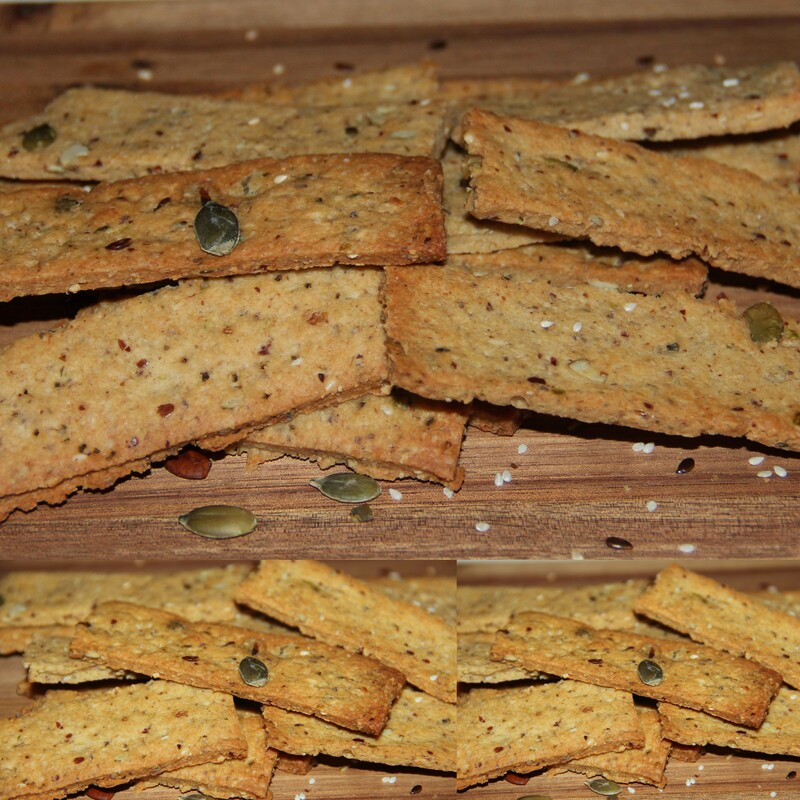 Switch and swap flours and seeds to make a new crackers as often you feel like working out your fore arms. Pumpkins seeds are rich in the amino acids alanin, glycene and glutamic acid, as well as being a good source of zinc and omega-3 essential fatty acids. They also contain protein, iron and phosphorus and are low in carbohydrates. Sesame seeds are packed with protein, iron, zinc, magnesium, calcium and phytic acid while being low in carbohydrates. They may help lower cholesterol levels, and are a well-known source of vitamin E plus omega-6 and monounsaturated fats. Flaxseeds/Linseeds are an excellent source of omega-3 and omega-6 essential fatty acids, which are needed for most bodily functions, as well as dietary fibre and manganese. Pre-heat the oven at 160deg c. line the baking tray with baking sheet, grease some oil and set aside. Knead the dough for 2-3 minutes wrap and set aside for 15-20 minutes. Using a sharp knife or pizza cutter, cut the dough into rectangles or diamonds of approximately 5x15cm. Bake for 12minutes, flip over and bake for another 8-10 minutes or until golden on both sides. Serve for snacks or once completely cooled store in airtight containers. Baking time may vary with each appliance so keep an eye and bake until golden in colour. Posted on January 21, 2015, in Appetizers, Breakfast, Indian, International, Starters. Bookmark the permalink. 29 Comments. I have been working on a nut/seed cracker and have batch number 2 in the oven right now! Great minds think alike?? 🙂 These look very tasty! Your crackers look delicious and the mix of ingredients is really interesting. Can I just use regular whole rolled oats and run them through the food processor to get powdered oats? Wow, cant wait to try this! Hi Chitraji, this snack item looks yummy! I wanted to try biscuits that are cooked on tava. I think, I can try this on tava too, what say? Oh my god, absolutely drooling!!! Hi Chitra, Any substitute for Maple syrup ?